First we gathered some vintage pieces: a large blond vintage table cloth, some octagonal yellow floral placemats and a special Bavarian tea set which has little blue forget-me-not flowers and some silver gilding. A large round old gold teapot and some second hand amber glassware with an iridescent finish give an inviting boost of sunny colour whatever the weather. 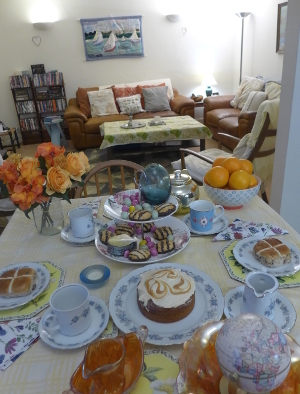 Then we added a gorgeous porcelain cake stand which amazingly is from Tesco. A marine coloured egg shaped Danish glass stem vase reflects the candy egg theme. From Marks and Spencer we added a mini globe to continue this spherical idea and sugar eggs to top it all off. Salted caramel and chocolate hot cross buns are a new and winning recipe. 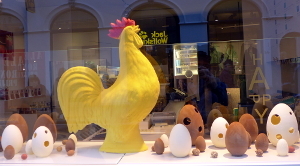 We would of included this amazing chocolate hen if it could have travelled from the covered Mall in Brussels and arrived in one piece. Fresh oranges are added to our festive spread in a hand sponge painted Bloomingville fruit bowl. A Laura Ashley faux rose bouquet sits in a large jam jar. This arrangement is a good alternative to the fresh branches with buds we will bring in from the garden fresh when it stops raining heavily. To complete our Easter tea we like the salted caramel cake from Co-op finest range and gluten free chocolate coconut cakes from Aldi. The wall hanging with boats in Osbourne Bay and all the soft furnishings in the sititing room are designed and handmade and available to order from Create Display. 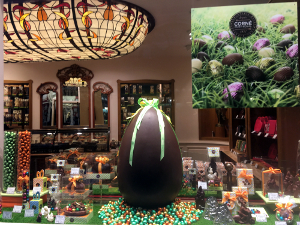 In Brussels in Belgium we admired the way the The Corne Port Royal Chocolatiers amazing large egg and tempting display is set against a traditional backdrop of dark wood furniture and a stained glass art nouveau ceiling light. 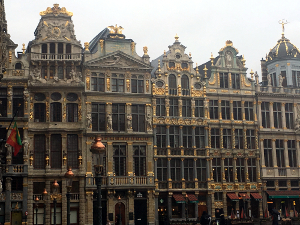 The 17th century architecture in Belgium is breathtaking and we loved the gilt flourishes we saw recently on these beautiful buildings in the Grand Place in Brussels. Even on a day with dark clouds in the sky the fantastic stonework and shapes on the facades lit up the city square which was alive with cafes and continental character. In Bruges the tall classical shops and homes were very elegant and featured traditional French style interiors. 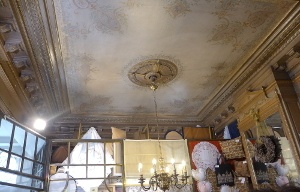 This moulded and painted cream and gold ceiling is in a wonderful shop full of lace and textiles called Kanten Rocco Daniels. The Belgians are famous for their lacemaking. 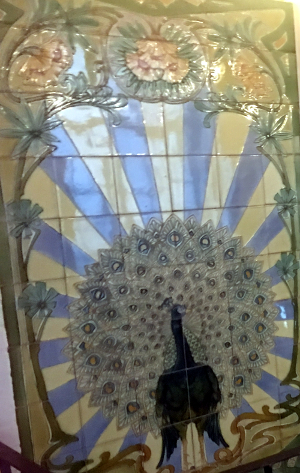 We found this large art nouveau influenced peacock tile feature in the 17th century town house we visited. The ceramic centerpiece looked amazing as a focal point between the kitchen and the hallway, An hand crafted original wooden spiral staircase spanned the five floor house which was very stylishly restored. However climbing up and down the flights was not for the faint hearte or those who had sampled more than one or two glasses of the excellent local beer, cider and wine this area also specialises in. At the Desigual fasion store in central Brugge the elaborate backdrop of the city blends well with this contemporary shop interior with warm metallic paint on white painted walls. 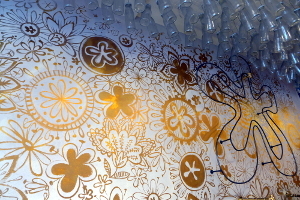 An unusual and modern fancy chandelier effect is created with hundreds of hanging glass bottles catching the daylight. 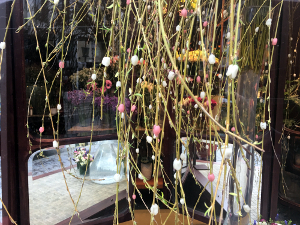 In Brussels the Daniel Ost florist occupies a stunning art nouveau shop front full of displays with a wonderful array of top quality sculptural flowers and plants. The many ivory and pale pink buds on these branches celebrate Spring simply perfectly. 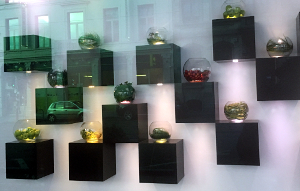 The NH hotel in Brussels has a frontage that contains a window with several smart black wood boxes which make miniature gardens glow when they are lit from beneath. The glass vases are all the better for being seasonally spherical and it is lovely to look at the individual plants inside each one. 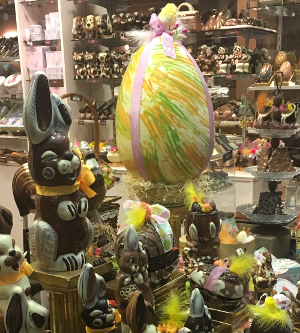 This post concludes with an impressive huge golden egg from one of the windows of one of the many amazing and delicious chocolate shops in central Brugge. It is well worth a visit to sample all the good quality confectionary and admire the sculptural talents and creativity of the chocolatiers especially at The Chocolate Line. We hope you have a fabulous Spring and here in Sussex we are happy about the longer lighter evenings and looking forward to walking with the trees in blossom and getting out on the water again soon.